Mixing art with science to help preserve one of our five basic elements may strike some as a bit odd. A timely request considering recent headlines regarding lead and other contamination found not only in Flint, Michigan’s drinking water but in nearly 2000 other American communities according to the last EPA findings. And if that isn’t personal enough, we are reminded that we are composed of 60% water. We truly are what we drink. An “open” mind one might add; open, that is, to the concept that art can advocate for social changes for the better in ways that science alone may not. Because scientific installations in Water speak eloquently and convincingly about pollution and sustainability on a global scale, our purpose here is to note how and what the exhibit’s major artists and their work add to the conversation conceptually and visually. Those artists include Susan Shutan, Susan Knight, Ran Hwang, Matt Dehaemer, Ying Zhu, Larry Sosso and Iggy Sumnik, who all created art and installations specifically for Water. Mind you, there are other artistic contributions here, specifically: Pierre Carreau’s four painterly photographs, “Aquaviva,” whose majestic beauty run counter to the reality of rising tides and climate change; five untitled images from National Geographic photographer Joel Sartore, who documents nature’s seasons, flora and fauna on location but without augmentation. Next to these, imagine Carreau’s images coming to life and you have an abstract, lyrical video from artist Amy Kaczur titled “Yampa Sounds,” shot on location in Colorado honoring the last major free-flowing river of the American West. Kaczur’s waterscape advocates poetically in opposition to water-rights bids to divert water for energy oil-shale development. Though the video includes suitable environmental “Sounds” of wind, thunder storms, Sandhill Cranes, geese and elk, the viewer will most remember the hypnotic “Sights” and score of an ebullient brook whose transparent and reflective nature continues to feed both body and soul. Equally impressive is the collaboration of poetic and visual imagery titled “Water’s Edge: Open to Interpretation,” each a combine of photo and accompanying poem taken from a juried exhibit and book competition organized by Clare O’Neill, project curator. Though several samplings are uplifting expressions of water’s power to move the human spirit, it can be argued that this “people’s choice” is the most down-to-earth work in the exhibit. Of course the most elemental installations in this exhibit are the many scientific displays devoted to water pollution and sustainability from the likes of Healthy Rivers Partnership, Omaha’s Stormwater Program, the Missouri River Research Station, UNMC College of Public Health and UNO’s Aquatic Toxicology Lab, all of which work to improve water quality in the Nebraska watershed and in our own backyards. Not to forget the efforts of the Planet Water Foundation which aids over one billion people worldwide who do not have access to clean, safe water, as well as installations from Whispering Roots, Valmont Industries and the Robert B. Daughtery Water for Food Institute on behalf of water safety and conservation. If viewers give this many-layered exhibition the time it deserves, they are likely to leave as better citizen-scientists. The science and evidence is that convincing. Yet without the art to whet the appetite, it could be argued that the exhibition would soon run a tad dry. At first glance, the artworks seem only to point to the water’s inherent aesthetic, but the artists’ collective vision here brings more to the table than enticement or embellishment. Shutan’s focus in the past has been toxic waste and runoff in drinking water as well as environmental disasters such as global oil spills. Her two major installations in Water combine the real and the imaginative in ways that are paradoxically troubling and engaging. There are lessons in her work but they are neither sugar-coated nor didactic. Her art strikes a nice balance of creativity and science. They are “think” pieces, even guilty pleasures. For instance, in the main bowtruss gallery—now at the end of the long hallway as you enter from the west side near the library—her installation “Flow” dominates the space with its ironic title and contradiction of life and beauty, relieved in part by the several science projects sharing the space. This is where the viewer should begin, but until Kaneko’s atrium is finished, one will be distracted by several more traditionally attractive pieces. “Flow” sets the appropriate tone for Water. “Flow,” an undulating web of black tar roofing paper, some 40 or so feet long, is a visually striking shout-out about the toxicity of our environment, particularly the impact of oil spills. 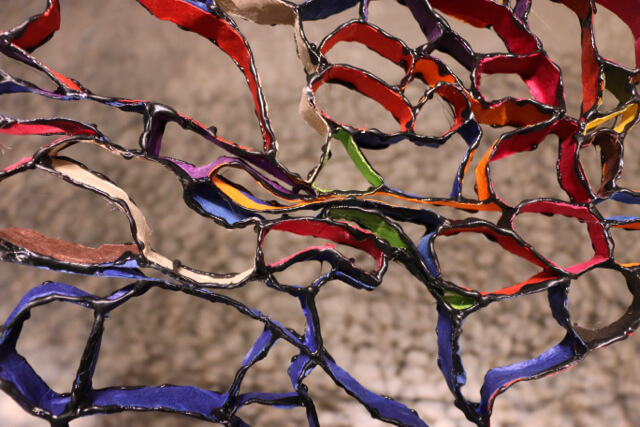 There is a great deal of push/pull in this exhibit, none more so than here, as what is “flowing” are the very colorful pollutants Shutan has embedded into the porous, lava-like webbing. The installation is black and menacing in its portent but alluring as well with its neon, phosphorescent palette glowing within not unlike that seen in an oily pool bubbling up crude. This isn’t water flowing. Shutan has our attention but are we heeding her warning? Back in the hallway, we pass under Larry Sosso’s clever school of “flying fish,” whose title, “Yellow Perch,” doesn’t do it justice, as it wisely swims above the fray. Next is Sumnik’s engaging aquarium of playful pisces who set the stage for the next stunning installation on the right by Knight whose tone and vision may run counter to fellow collaborator Shutan, but nonetheless shares her environmental concerns. Emphasis on “interesting,” though even that is an understatement in describing her two installations, the delightful “Water Bank Boogie” and the more ethereal “Hidden Magic” across the hall in a larger gallery space. Visually stunning, the former’s rainbow pattern is in sharp contrast to the latter’s monochromatic white, yet each a product of Knight’s signature delicate hand and youthful imagination. “Water Bank Boogie” does indeed move to the rhythm of Kaneko’s air currents, as if undersea, even as it descends under its own weight. The site-specific installation’s various expanding objects suggest obvious comparisons to bells, jellyfish, coral and sea anemone. Some may even see references to Chihuly glass sculpture, but there is more substance in Knight’s aesthetic, underplayed as it may be. The primary pastels of “Water Bank Boogie” are color-coded to represent clay, gravel, sand and silt that provide a network watershed to prevent runoff pollution. The work reminds us that we all live in harmony in a fragile water environment even when not fully immersed. The skeletal shadows on wall, ceiling and floor are less than subtle reminders of devastating pollution runoff as in our diminished coral reefs. Across the hall, Knight’s “Hidden Magic” of Tyvek and Mylar paper is her “hanging garden” designed to hold rainwater runoff from roofs, pavement and other hard surfaces until it seeps back into the ground to the consternation of mosquitoes and other pests—all planted with a deep root system that aids natural filtration. White porous pods of many surfaces, like so many sponges, float before a waterfall of roots that reflect and absorb light as if it were water. The uniform icy-white color of “Hidden Magic” reinforces the garden’s purification process as a gentle rain seems to fall and percolate to the ground. Knight’s work has always had a transformative nature and once again she works her magic here. On the south wall of this gallery is Shutan’s variation on a topo map of Nebraska that keys on the state’s groundwater structure and wells. In its own way this map with its prosaic title of “Nebraska Groundwater Wells” is just as beautifully foreboding as Shutan’s “Flow,” as it highlights the number of polluted wells with scary hot color pompoms that easily outnumber wells marked in cooler, natural colors. The map is a rather sublime left and right brain paradox of how we destroy the very thing we rely on for growth and sustenance. Less effective in this gallery, at least visually, is Ying Zhu’s “Passing Through the Iridescent Sea of Pearls.” A corner installation composed of a compartmentalized fish tank and fish, as well as other colorful particles symbolizing the scientific principle “parts per billion.” In this display, the work supports the exhibit’s dichotomy of water pollution and sustainability as well as the artist’s familiar themes of mutability and sublimity. But her now signature motifs of mirrors as “pearls” of incandescent crystal embedded on tank and wall behind are a bit too ephemeral for the work’s serious nature. Easily the most “art for arts sake” installation here, as well as the least pretentious, is the exhilarating video and sculpture of Korean Ran Hwang titled “Garden of Water.” Ran has assembled three overlapping chandeliers of crystal beads in the form of a spider web through which a gradual, then sudden, video downpour is displayed. Quite breathtaking and less cerebral than other works in this gallery, nonetheless “Garden of Water’s” network of grace, light and symmetry reinforces water’s ability to quench both body and soul. Conversely, Kansas City artist Matt Dehaemer’s most cerebral and inventive installation, “RE: LAPSE,” is center stage at Kaneko on the second floor. Composed of corn stalks, meal, Japanese rice paper and several moving parts, this kinetic wonder is so convincing that it nearly passes as a possible combination harvester/central pivot irrigation system. “RE: LAPSE” moves around a giant pulsating blue water drop at about one revolution per minute. On the one hand this “bit of machinery” references the interdependence of nature, man, industry and grain to feed a global population in a cycle of preparing, planting, cultivating and harvesting the land. It also points out that if you take water out of the equation, nothing else is left. Science can discover and teach this to a public, that is, one open to the facts of agricultural pollution, as well as fracking, but art, as seen in this exhibition, has a way of its own to help clarify priorities. Oil and water do not mix well, but art and science can when it comes to creative solutions in sustaining what constitutes nearly two thirds of our make-up. Water continues to flow until April 23 at Kaneko, 1111 Jones St. For details go to thekaneko.org.